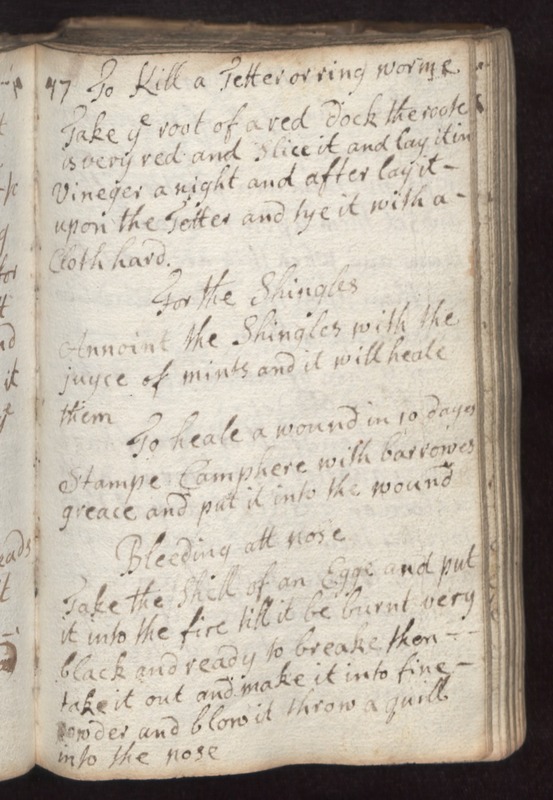 47 To Kill a Tetter ro Ring Worme Take ye root of a red dock the roote is very red and slice it and lay it in vineger a night and after lay it upon the Tetters and lye it with a cloth hard. For the Shingles. Annoint the Shingles with the juyce of mints and it will heale them. To heale a wound in 10 dayes. Stampe Camphere with barrowes greace and put it into the wound. Bleeding att nose. Take the shell of an egge and put it into the fire till it be burnt very black and ready to breake them. Take it out and make it into fine powder and blow it throw a quill into the nose.